The National Museum of the Maison Bonaparte is the cradle of Napoleon but also of all his brothers and sisters, except for Joseph, the eldest, who is born in Corté in 1768. Napoleon thus saw the day in 1769, Lucien in 1775, Elisa in 1777, Pauline in 1780, Caroline in 1782 and Jerome in 1784. All grew up under the thumb of their parents, Charles and Letizia Bonaparte, of their uncle Joseph Fesch and their great-uncle Luciano Bonaparte. 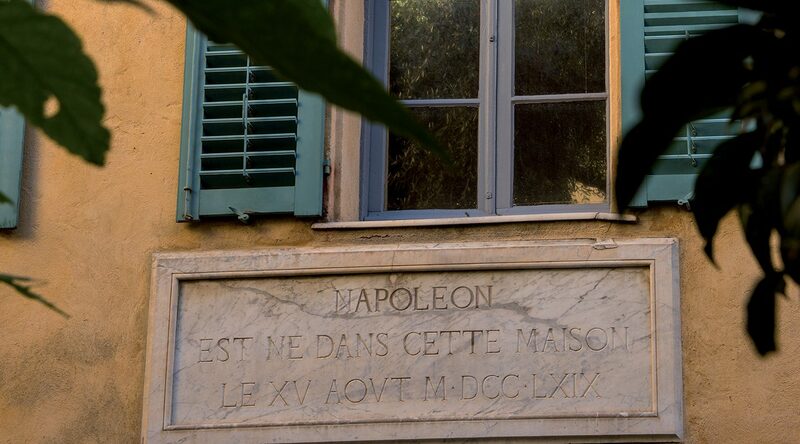 This house is witness to the rise of Napoleon and Joseph when they seized power in Ajaccio in the early 1790s. to utter these prophetic words to Great Uncle Luciano: “My existence is no longer necessary for Charles’s children. Joseph is now at the head of the administration of the country, so he can direct that of the family. You poi Napoleone, sarai a uomone (as for you Napoleon, you will be a great man) “. In 1793, the Bonaparte are forced to flee from Ajaccio, abandoning their home to supporters of Pascal Paoli who sack it. The following year, during the annexation of Corsica by England, Hudson Lowe will be lodged there (20 years before becoming the jailer of Napoleon in Saint Helena). The destiny of the cradle of the Bonaparte is then quite chaotic. From 1797, Joseph Bonaparte, his mother and his uncle Fesch undertake renovations and enlargements until 1802. In 1805, Napoleon gives the house to his cousin André Ramolino, then it is recovered by Letizia Bonaparte in 1832 and finally returned to the patrimony of Joseph Bonaparte in 1843. Upon his death, his daughter Zénaïde inherited it before offering it in 1852 to his cousin-german Napoleon III who leads in turn restoration work, embellishment and enlargement. In 1873, at his death, his wife, the Empress Eugenie, became owner of the place until 1921, when Prince Victor-Napoleon inherited it and gave it to the State in 1923. immediately proceed to classification as a Historical Monument. However, it was not until 1967 that the house became the National Museum of the Maison Bonaparte.